Carol and her horse Surri hauled me and Jose to Karen's house for a ride with Karen and Gil in the Owyhee foothills up above Murphy. It was a chilly gorgeous fall day, perfect for a ride, though I sure could use some warm riding gloves. The thermometer said it was 48*, and it sure wasn't one degree over that - there was a good bite in the air from the westerly breeze. We headed for Moore's Creek where Jose and I went with Karen and Carol last year to check on eagle nests, but today we turned to the west before we started into the canyon. 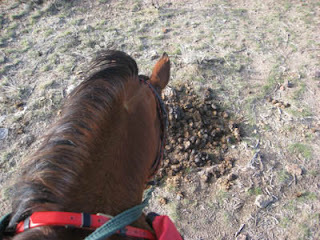 We climbed upward a couple hundred feet above the flats, passing two springs, and at the second one (piped into a water trough) we started seeing a lot of big horse poo piles - wild stallions leaving their marks. Jose was fascinated by the piles - he had to stop and thoroughly sniff every one of them. 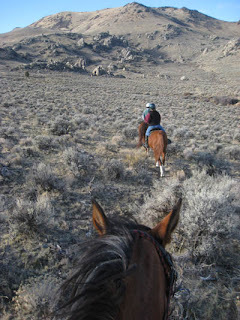 The BLM had done a wild horse gather here in July of 2007. 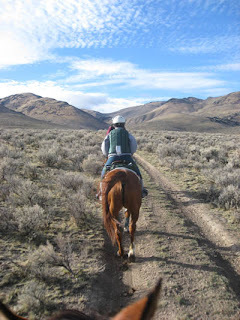 From July to September of 2008, Karen had seen, several times while out riding, a herd of about a dozen wild horses hanging out on the flats between these foothills and her house. She hasn't seen them since. 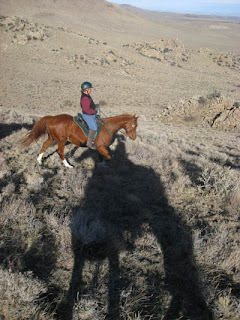 But she had seen a couple of stallions on her last couple of rides in this same area - a chestnut and a buckskin. Often when a stallion doesn't have a herd (i.e. girls to fight over), he'll buddy up with other bachelors. We descended back onto the flats, after stopping to admire the view of the distant Snake river valley to the north, and the further snow-covered Boise mountains above that. Then as we continued west, there they were - the two stallions Karen had just been talking about, on a hillside about a mile away directly ahead of us. If there's enough feed (there was plenty of winter grass) and water (the springs), and the weather is mild (only one skiff of snow so far this fall), and it's safe (not many humans bother to go out there, and cougars are present, but not abundant), the horses have no need to roam great distances. We were downwind of them, but it wasn't long before the chestnut's head popped up from grazing and turned immediately toward us. He was at a right angle to us, but something had caught his ear or eye or survival instinct. He couldn't have heard us, with the breeze blowing toward us, and the sun was at our backs, so he must have only seen 3 indistinct moving black dots. He stared in our direction for a while, and then he decided we were more than just dots. He turned to face us, and even from the distance, you could tell he was on full alert, his head high in the air and standing completely still. He stared some more, then he decided we were something to get a little alarmed about. 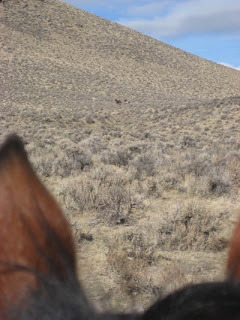 He turned a prancing circle and stopped and faced us again, and by now the buckskin knew something was up, and he too was on alert and a bit excited, also turning to face us. 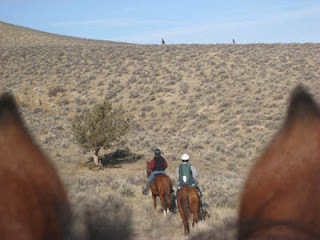 Now our horses had seen them too - a couple of horses in the distance running around - but with no rider! And the two were acting funny - what was this all about!? Jose was extremely interested in investigating. The two stallions decided that fleeing was the best option, so they whirled as one and ran away, heading uphill. Just at that moment, we went down in a little drainage and out of sight for a while. A few minutes passed while we continued walking along our trail, then suddenly on the little rise about a hundred yards ahead of us, the two stallions popped up on top. Their curiosity had overcome their fear, and they'd come back to get a closer look at us. All 5 horses - domesticated and wild - were on full alert. We all stared at each other. The stallions looked down at us, whirled and ran and came back and stopped - the chestnut spinning away out of sight then coming back to the top of the ridge, the buckskin running back and forth, his tail in the air - and our horses' eyes and ears were riveted on them. Karen's horse Gil had seen them before, and in fact had been closer, so he wasn't worried, but Surri was definitely consternated, and Jose - well, Jose was absolutely enthralled, and he wanted to go closer! Jose loves everybody (and everybody loves Jose) and I'm sure Jose wanted to go make their acquaintance, and I don't doubt Jose would have induced them to play for a bit. Of course, he might have gotten chased, but he would have made a game out of it. Finally the two stallions whirled and took off running, for good this time, and Karen and Carol turned to leave; Jose really wanted to follow the stallions. I urged him to follow his domesticated buddies, but he kept stopping to look back, bewitched, until the stallions became such dots that they coalesced with the distant hillside. 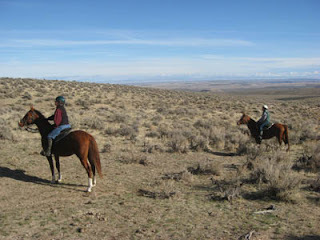 Karen figures they escaped the BLM gather - the helicopters rounded up the herds of mares and foals, but it's quite likely they missed lone stallions hiding out in draws. 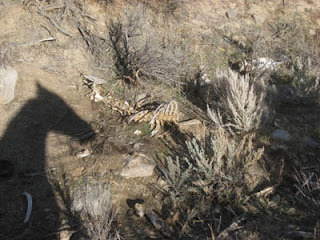 On our way home, Karen took us by the skeleton of a wild stallion - she'd came across him in April, alive but emaciated and dehydrated, and she'd found his skeleton 2 weeks later. We passed loads of poo piles, so many that Jose only chose to stop and sniff the biggest piles. 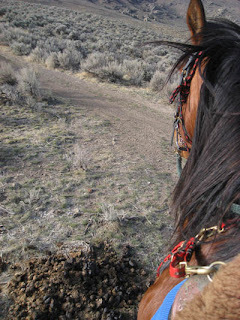 It's romantic and exciting seeing wild horses running free... but it is a hard life out there in the wild for a mustang. It's something we all know and can accept: Nature taking care of Nature. But then there's the dark, realistic side of wild mustangs: the BLM is in a pickle with 30,000 wild horses to deal with. Make that 66,000 wild horses: 33,000 wild ones roaming 10 Western states, and approximately 33,000 in BLM holding pens. What do you do with them all? Living long-term in a BLM holding facility is no way for a wild horse to live. And some live there for 20 years. And 33,000 of them aren't handled and gentled and petted and ridden and given treats in these pens - they are just fed hay every day. That's it. In limbo between wild and domesticated. Not to mention feeding 33,000 horses every day costs a lot of money, (as does the man-power to put it out), as most of you with horses right now who are complaining about the price of a bale of hay (and the availability) will attest to. While the BLM has, since 1971, "adopted out more than 220,000 horses and burros" (did they all live happy, safe, long lives? ), trying to solve the problem of too many horses by offering mustangs for a nominal fee to anyone to adopt is somewhat hopeful, or foolish, when you consider the regulations. Your application will ask to describe your "corral" and "shelter" and "access to water" and "type of feed"; you'll draw a layout of your corrals, and a map of where the horse(s) will be kept from the nearest highway; it will ask if you've ever been convicted of abuse or inhumane treatment of animals (that's "convicted"). (If you were convicted, and you checked the "no" box, would anybody know?) The form doesn't ask anything about your experience with horses, though that would seem to be a rather big factor to consider. Sign your name to the Terms of Adoption and agree not to perform any of the Prohibited Actions, and if your application is approved (and why would it not be, if your drawings and answers look good? ), and your wild horse is ready, bring your check for about $125. Bring a nylon halter and lead rope. You get your wild mustang. Sounds easy, doesn't it? Sounds fun and idyllic, doesn't it? How many people who get a mustang know next to nothing about horses, much less a wild mustang? A young homebred unbroke Arabian can be handful enough to start and train. I've heard from several people that mustangs are a 'breed apart,' (pardon the pun), that you handle them in a different way, because they think differently. That is only common sense given their heritage, and the one mustang I've been around and ridden, fits that category. But when you have too many wild horses roaming the ranges, horses die from lack of resources - food and water, as the skeleton that Karen came across proves. Suffering in that way is not pretty. But what do you do - shoot thousands of mustangs? Send them to slaughter? That is absolutely tasteless - and just wrong. But then what - make adoptions easier? I don't think this is the best possible 'solution.' It will likely lead to more mustangs going to slaughter - people doing it for profit, and people who just can't handle this 'pet' mustang - or afford to feed him - that they've mistakenly adopted. 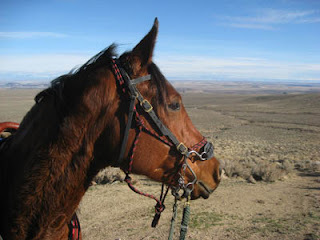 Once the mustang leaves the BLM, there's no way BLM has the man-power to check up on every mustang that's been adopted. I don't have the solutions. I just enjoyed the privilege today of getting a glimpse of these two wild stallions. Jose enjoyed it too.